I've finally gotten a card done for the progressive challenge at Sasayaki Glitter! Nothing like scooting in right before the deadline. lol Too much Christmas visiting, I guess. Obviously, this snowman loves winter because in any other season, he'd melt. :-D I colored with ProMarkers, then cut the image with a CUTplorations die. The snowflakes were made with a die from Spellbinders. The sentiment was printed and cut by hand. 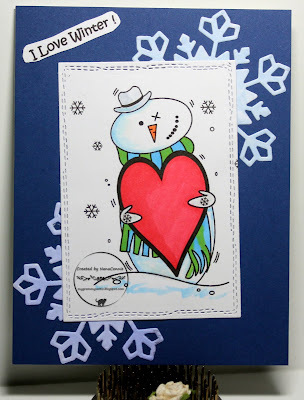 Another wonderful card and love the snowman. Wishing you a happy and healthy 2019 my dear friend.